Jamie McDonagh was shown a second yellow card in the tunnel against Finn Harps last weekend. DECLAN Devine claims Jamie McDonagh’s ‘silly sending off’ has left him with a selection headache going into tonight’s clash with UCD in Belfield. The winger received a second yellow card in the tunnel at Finn Park after Friday night’s derby win and sits out tonight’s match against the Students. With Conor McDermott (hip) and Adrian Delap (hamstring) struggling for fitness ahead of the trip to Dublin, it leaves Devine with a few selection problems on the right flank. “Unfortunately Jamie has picked up another silly sending off. He’s picked up two needless yellow cards, between the penalty incident and after the final whistle so Jamie will miss the next couple of games. It was needless and causes us a few problems in terms of our numbers. City romped to a 3-0 win at home when the teams last met on the opening night of the season but Devine, who takes charge of his hometown club for the 100th occasion, expects tonight’s clash to be a totally different affair. “It’s definitely a different game. They’ve grown but so have we. We’ve got better from the first game. 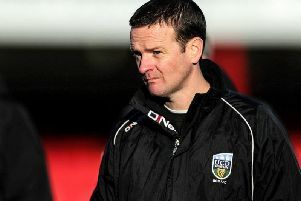 “UCD had a fantastic result against Waterford and if you’re not ready mentally to go into this environment then it can always throw things up at you. The boys have trained brilliantly and came down quickly off the high of the north west derby. Ciaran Coll has returned to training following his injury sustained in the derby while Patrick McClean is expected to return to the starting XI. Peter Cherrie could also make a return.